I guess it’s been happening for a while now but in the past few weeks I’ve started to notice a lot more people doing this in the weirdest places. More and more times I am being confronted by people who are using the word “spirituality” like it is a bad word. Surprisingly it’s been happening in places where I’m gathering with people are supposedly here to serve. In Care of the Soul, Thomas Moore talks about how being super religious can be dangerous because it puts us in the perspective that we are right, which makes someone else wrong, which then creates an “Us vs. Them” situation which leads to patterns of abuse and violence. When I think of spirituality I think of those things that bring us peace. I think of the ways in which we listen to the inspiration that comes when we are “in-spirit”and to the intuition that helps us to interpret what to do with all that. We each need to tune in to our own inner wisdom to know which things bring us peace in our own hearts and souls. We need to learn to tune in to our kids and figure out how to parent them each individually, but find balance in parenting them all simultaneously (if you have more than one kid). We need to tune in to our environment and our society and listen to the needs of our neighbors. We each have different traditions that help us to find ways to balance it all. I love to move with the seasons and follow the traditions that I was raised with, but I also love to learn about how other cultures and other religions and places with other climates do these things differently. I love the family recipes that go with my religious traditions because it is one less day that I need to figure out what is for dinner. But if you want to make a dinner from your tradition I would love that even more if it means that I don’t need to plan and I don’t need to cook. When it is my decision and I need to figure out what to do, I usually choose what I think is right based on all of the knowledge and the resources that I have at the moment. I just had to look in my pantry and my fridge and think of something to make for dinner tonight. I have to figure out how many appointments and meetings and sports practices I have today and then decide if it is a crockpot night or a stir fry night or a boil some pasta night. I am confident that I made a good choice, but I am sure that there is more than one right answer. But if my selection meets all of the various needs of the members of my household and doesn’t hurt anyone else, then I can have some peace about this choice and move on to worrying about bigger things. My spirituality is how I tune in to all of these things so that I can do all of these complicated calculations and still find balance and have some peace. As mothers we are always thinking of so many of these things. We want what is best for our children, but we are also trying to figure out how to make sure that all the babies are fed and even while we are making dinner for our family we are grieving for the kids who don’t have dinner on the table tonight. Our mom-hearts have to hold so much. So I send love to all of those children as well. And I work to end the patterns that have created this “Us vs Them” that leads to so much hurting in this world. I don’t like that in our society we throw away food instead of feeding the hungry. But I need to choose how and when I can help and figure out how I can still function. When I had postpartum depression I was so open from having just gone beyond the veil during my birth and I could feel all the suffering in the world. I could feel the moms with the broken hearts because they had no food to give and I could feel the babies that were going hungry. I couldn’t function when it was all so close and so big. So I needed to learn how to manage all of it so that I can do my piece and support everyone else on this planet to do their piece. If we all do our piece then we can all find some peace. But when we use spirituality as a bad word and attack the people who are trying to help, then it just creates further division. When you say something mean to the volunteers, you don’t just ruin their day, your take away from all of the people that they were trying to help. Instead of criticizing, maybe think about how you could support that volunteer so that they can do their piece even more efficiently. How could you work together? Often there is no right answer. And there is enough work for all the helpers. There are so many ways in which we can serve. I just showed a video in a class about managing organizational structure and how to manage stress in the workplace. Whether you are managing a company or a department or a household, you need to understand the science behind stress to know how you can help people to function when they are in that Fight, Flight or Freeze response. In this Ted-Ed video it shows the underlying causes of stress, how the stress response works, and the long term effects of chronic stress like learning disabilities and depression and Alzheimer’s. But then it shows you the ways to find balance and re-wire your stress response. And I hate to tell you, but the tools and techniques that science has found to be the most effective are things that sound kind of spiritual or “natural”. They tell you to try exercise and meditation. They tell you to learn to be mindful and present. They have even found that hugs can heal and prayer works. They say to go outside in nature. It all works. I can show you how if you want to find ways to balance it all, then you not only feel peace in your soul, but you also can stop suffering from those chronic diseases. You can stop being in pain. That is how I started on this journey. I didn’t set out to do some huge thing. I just wanted to stop being in pain and all of the doctors and the medical tests didn’t give me any answers and the pharmaceuticals numbed it but didn’t really change anything. They helped me to manage the pain and to function somewhat so that I could get out of bed and go to work or make dinner for my family, but they didn’t make the disease (dis-ease) go away. So I tried something else. If you are like me and trying to feel better while balancing the needs of your family and trying to make the world a better place, then message me and we can start to talk about which tools you can try first. I know how frustrating (and expensive) it is to try a bunch that don’t work before you find the techniques that actually makes a difference. I use an applied kinesiology technique that can test for the technique that is optimal for you. And I can help you to find ways to implement it into your real life. I personally love techniques that I can use while washing dishes or folding laundry or driving the mini-van because then they actually get done! Anything that you can actually implement into your everyday life is better than all the things that sound great but are not realistic or accessible. I remember the first time that I was told to meditate to heal my postpartum depression. I looked at her like she had three heads because in that moment there was no way that I could do that. I needed to do a series of other things first. I wish someone had told me how to start. Maybe we should stop arguing about whether it is too “spiritual” or too “natural” or too whatever and just start being kind to each other. Go hug someone. Hold your baby. Take a deep breath. Smell a flower. The science has proven that spirituality works. Ask me about scheduling a private healing session or a healthy family consultation. 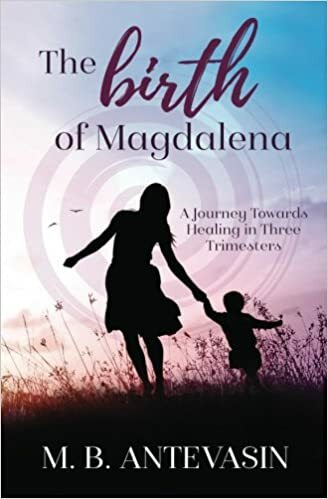 Read More about my healing journey in The Birth of Magdalena available now and about ways that I was able to incorporate these techniques into my everyday life in Magdalena Moments coming this Fall.